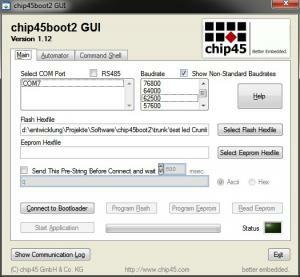 chip45boot2 is a professional bootloader for Atmel AVR ATmega and Xmega micro controllers with Intel hex file support and automatic baudrate adjustment. See infosheet for details. It is available as free precompiled hexfiles and commercial source code. graphical windows user interface chip45boot2 GUI for convenient programming from PC! In case you want to extend the bootloader by own functions or make changes to it, you can buy the source code (as AVR studio project for WinAVR) here. The chip45boot2 GUI is a comfortable PC/Windows application with a graphical user interface for the bootloader, which simplifies flash and eeprom programming over a COM port. Similar to the precompiled bootloader hexfiles, the chip45boot2 GUI can be downloaded for free. The most recent version available of the chip45boot2 source code will be send as ZIP file by email. No shipping charges are incurred.